Media: Soft cover with 248 pages of text, numerous black and white photos plus many in colour and 23 very useful colour side-profiles. Advantages: Covers all aspects of the aircraft's use by the RAN, informative and entertaining. Disadvantages: Some Australian Naval terms are not always explained, editing seems a bit loose (see text). With the release of both 1/48th and 1/72nd scale Fairey Gannets over the last twelve months, it's not surprising that publishers are starting to show some interest. 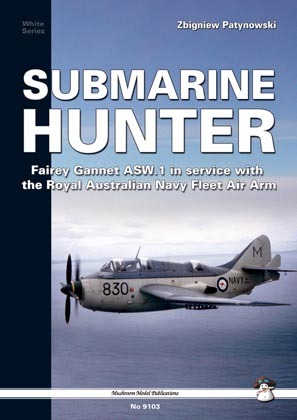 This book, from Mushroom Model Publishing, is not a detailed description of the aircraft and its development but rather first hand experiences from those who flew and maintained it in the Royal Australian Navy. From the beginning with both air and ground crews being sent to the United Kingdom to train on and pick up the aircraft plus Australia's second Aircraft Carrier, HMAS Melbourne, (HMAS Vengance was only on loan to the RAN from the Royal Navy), through various South East Asian cruises, the Melboune/Voyager disaster, to the final flights by the then aging Gannets. Air Crew thought, on seeing their first Gannet, that this big ugly aircraft could not possibly fly after the fighterish and handsome Fairy Firefly but did a complete turnaround once in the air. Ground staff who had never seen snow before let alone have to work in it and sailors who liked their beer chilled but having to contend with the warm stuff that flowed from the taps in England. And the girls, pretty, but didn't really want to know the boys from the land down under. Maintenance and deck handling staff, relating their experiences with the Gannet, some bad, some good, some funny and some sad but all with the greatest respect for the aircraft and its capabilities; like the anonymous deck crew member who casually walked out on to the flight deck of the Melbourne and leant against a blade of the front prop of a Gannet while the second was spinning and the whole flight deck held its breath for fear that he would move the wrong way into the rotating prop. He then turned and walked away none the wiser. Those that know who it was are'nt talking. While I was doing my time as a Naval Airman Photographer (NA Phot) in the RAN, I was told by another Naval Airman that if a Gannet had to do a wheels-up landing, the pilot would lower the bomb-bay doors and use them as skids to save major damage to the aircraft let alone the aircrew. I've never known if this was true or not (anything from another silly sailor is highly suspect) but it is confirmed by this book, both in the text and with several photos to back it up. Downsides? Sure, this book has faults, but only minor and they don't detract from the book's interest and usefulness. There's an almost full page on a WWII bomber crew being shot down over Holland from a speech by one of the crew to a Neighbourhood Watch group in Canberra. Interesting? You bet, but what's it doing in this book? There is at least one photo with the wrong caption. It's under the heading of “Interservice Cooperation” and has eleven Air Force types and three Navy in a group photo. Problem is, the caption only mentions three and one of those are Army. Most of the text is either written by the ex-RAN members or related by them to the author. In many cases, they use Australian Naval terms like “Scran” (a meal) or “Goffer” (a soft drink) but these are not explained which will be very confusing to most readers. There are 23 full colour side profiles of RAN operated Fairey Gannets and they are gorgeous. Some show both sides of the one aircraft while others just show one. Yet others cover the same aircraft with different code numbers or two different aircraft with the same number. The colours look very realistic and there is heaps of detail. Some may say “Ah, but there is no weathering”, but remember, Fleet Air Arm aircraft, in peace-time, were rarely seen with any wear and tear showing. Even in time of war, the environment they operated in kept them reasonably clean. As I said above, my criticisms are very minor. The text is very readable, interesting and entertaining and, I believe, worth the expense alone. The numerous B&W and colour photos not to mention the artwork are an added bonus making this one of the best from Mushroom Model Publications yet.